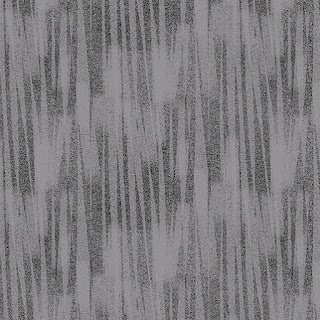 The Chalk Effects collection by Elise K for Contempo isn't exactly the opposite of White Out, but it provides a great contrast to it! 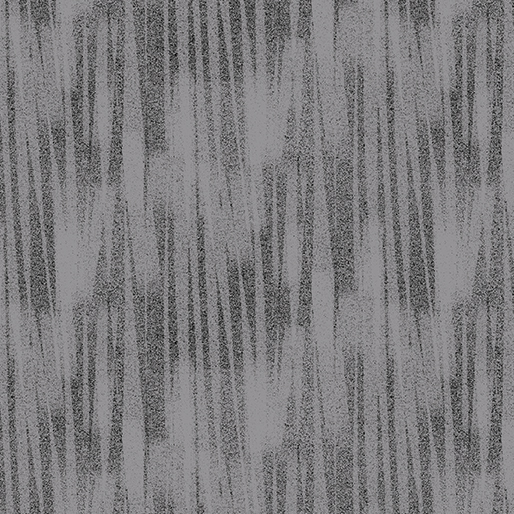 These tonals feature a variety of values, so they can be used in a quilt on their own or can be added to brights and patterned prints for nice, subtle background prints. 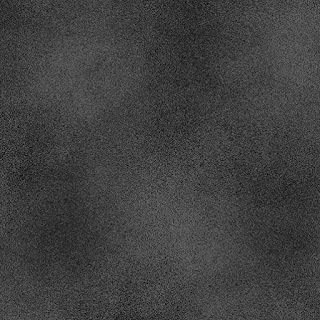 All the texture and fun of a chalkboard look without the chalky mess! 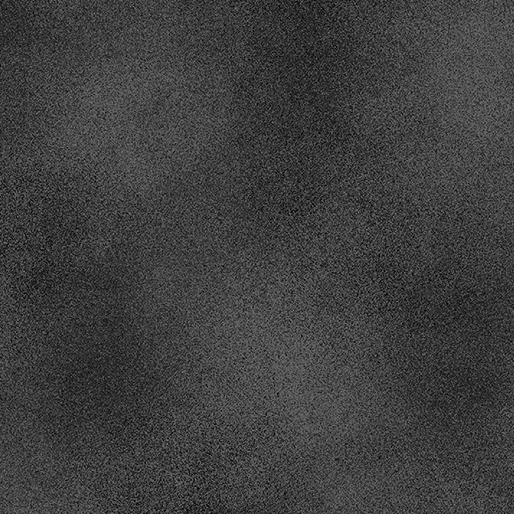 Click here to see the entire Chalk Effects collection. 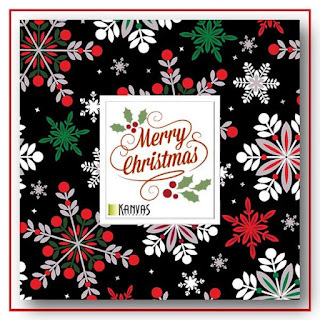 Whether or not there's snow on the ground outside your window, the subtle tonals in Kanvas' White Out collection will remind you of freshly fallen flakes. 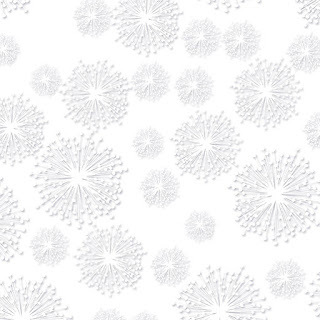 Twenty-two delicately etched prints showcase dandelion blooms, leaves, pebbles, flowers, snowflakes and more. 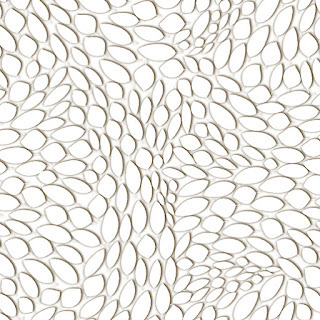 These prints come in two "colorways": white with silver and white with a pale taupe. 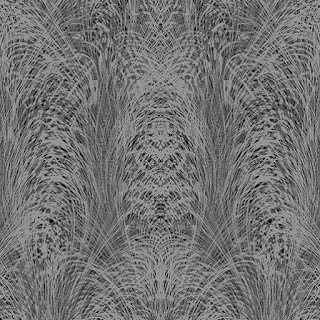 Perfect as textured blenders, backgrounds, and even in a cool monochromatic quilt design (scroll down to see it!). Stitch a quilt with a subtle design in warm tonal whites. 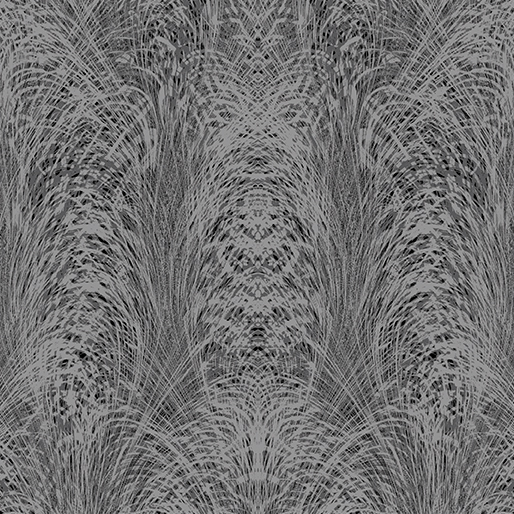 Find this free "Cascade" pattern on our website. 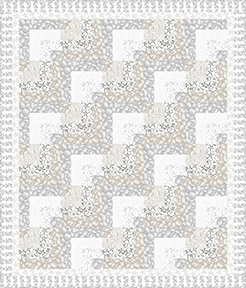 Click here to see the entire White Out collection and to find the free quilt pattern. 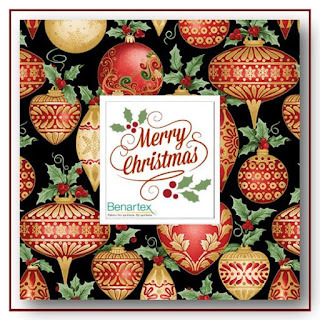 Wishing all our readers who celebrate it a Merry Christmas from all of us at Benartex, Kanvas and Contempo! p.s. 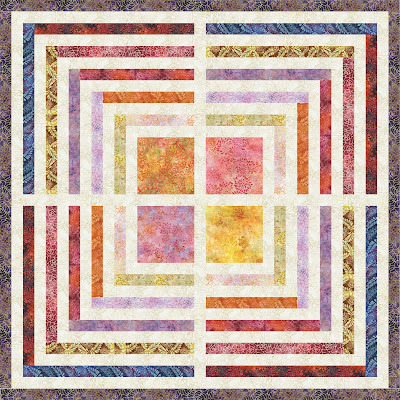 Make sure to check out Paula Nadelstern's Illuminated Star Quilt (and more!) 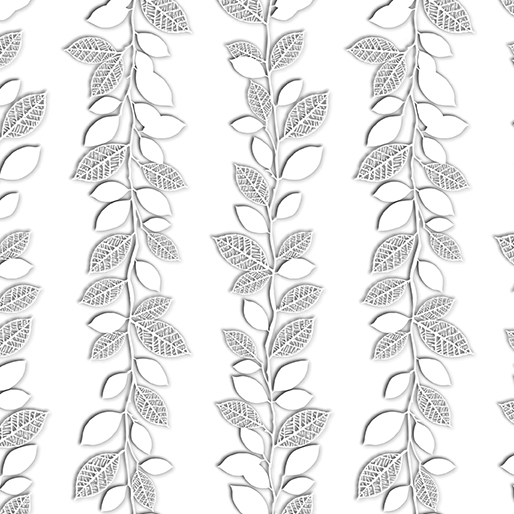 on Bernina's WeAllSew blog! 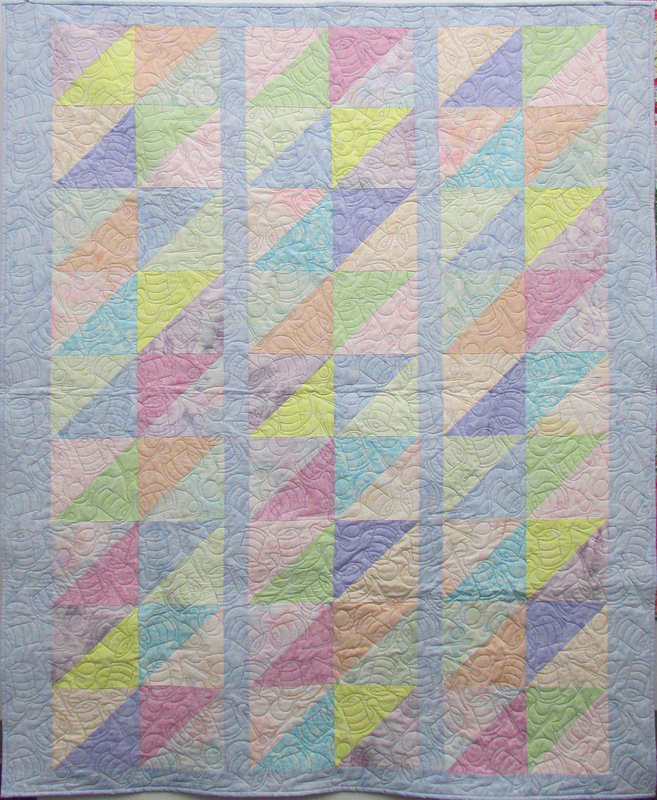 The quilt is featured in her new book, FABRICADABRA: Simple Quilts, Complex Fabric. 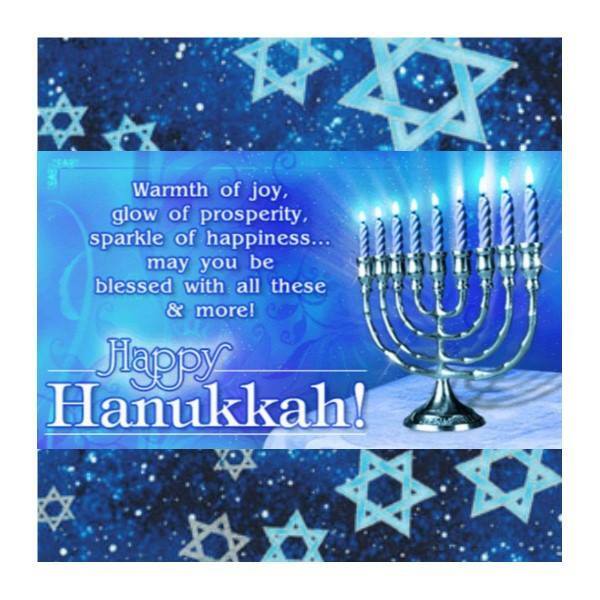 Wishing all readers who celebrate it a Happy Hanukkah from all of us at Benartex, Kanvas and Contempo! A little more eye candy...all the beautiful Balis we've showed you this week together! Balis in action: A section of our Quilt Market booth featured this array of skinny quilts using our Balis. 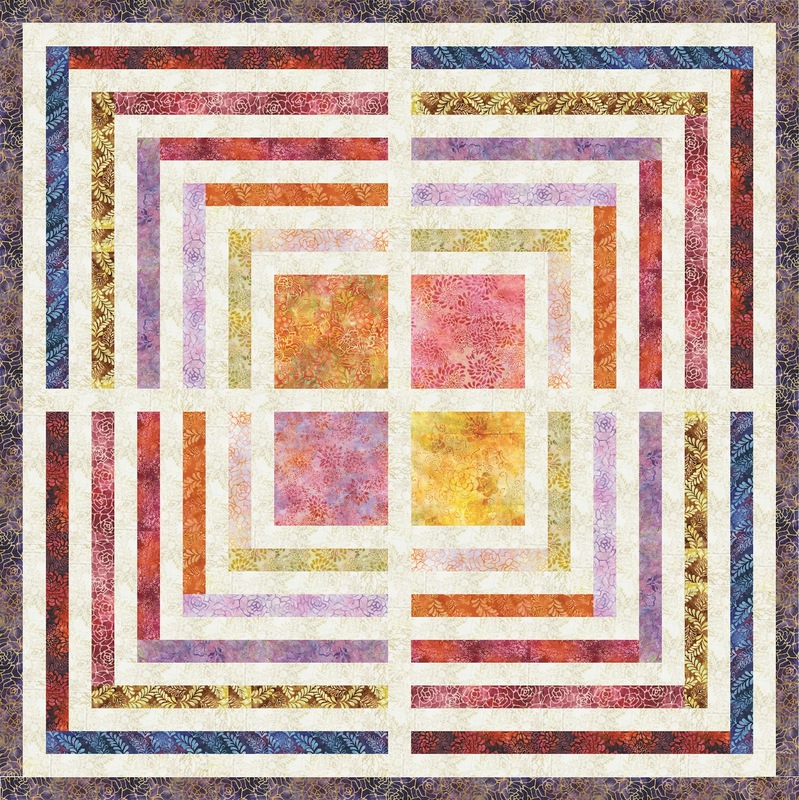 The following quilts are commercial patterns available for purchase. 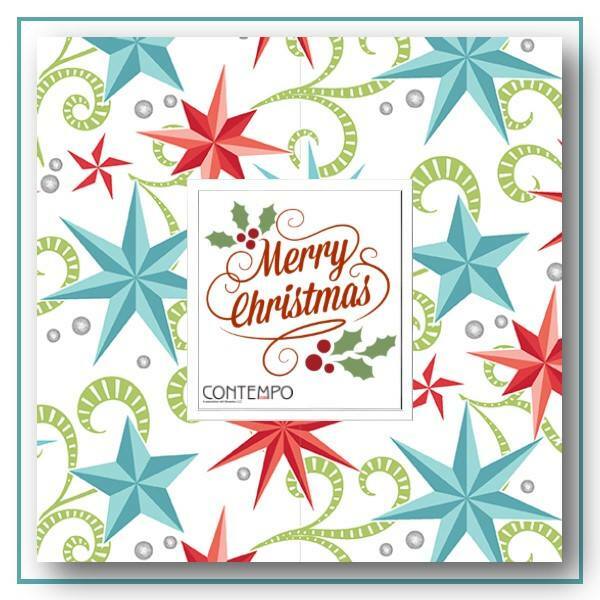 Find them here on our website or visit the individual designers' websites. 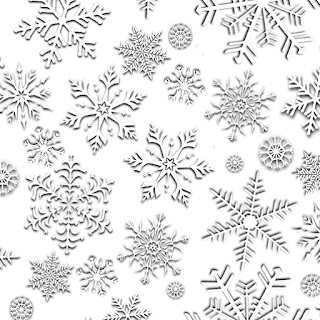 As your week likely ramps up with holiday busy-ness, we invite you to stop by our blog for a taste of calm, quiet beauty. 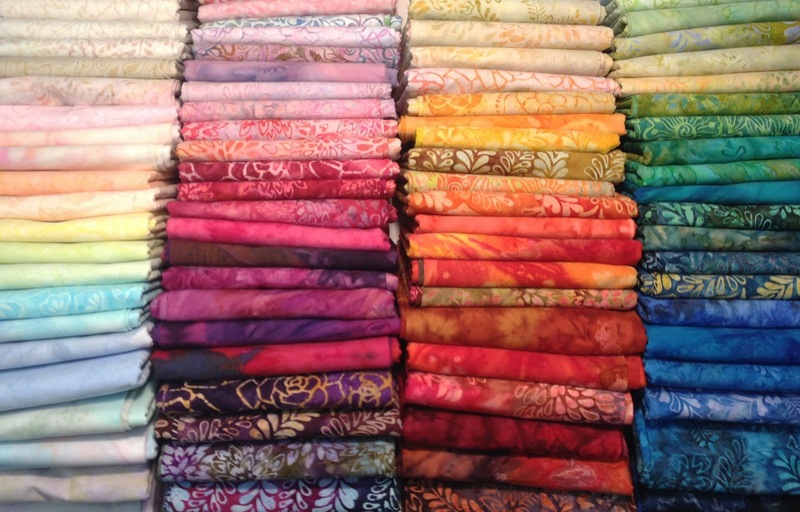 This week we'll be showing our newest Bali collections: dreamy, vibrant colors and patterns--much needed bliss in a hectic world. If this collection doesn't send you running to your nearest smoothie store to order a berry-flavored treat, we'll be surprised! From strawberry to blueberry and everything in between...yum! 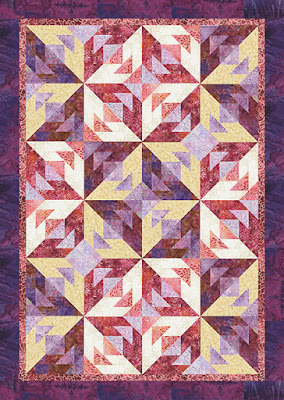 Click here to see the entire Bali Berry Delight collection. Missed our other Bali highlights? 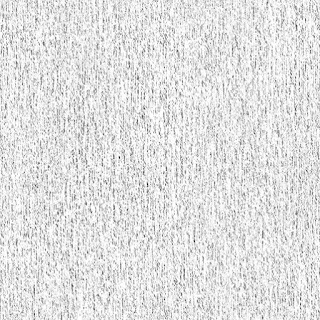 Soft, gentle neutrals and pastels...perfect for a baby quilt or for subtle backgrounds when paired with brighter, bolder Balis. These hues are like sorbet, cool and refreshing. Dig in! Click here to see the entire Bali Lullaby collection. Click here to see the entire Bali Winter Whites collection. Cool, soothing greens and blues...it's almost like your own getaway to a tropical island surrounded by shimmering water! This collection has such a great array of values, from the palest of greens to the darkest of blues. Delicious! Click here to see the entire Bali Cast Away collection. p.s. 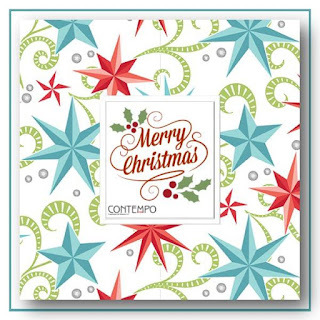 Did you see the winners from the Deck the Halls Blog Hop posted yesterday? Click here to see if you're one of them! Hot and spicy reds, oranges, and golds that just pop with color! On a cold winter's day, these balis will warm you up, no question. 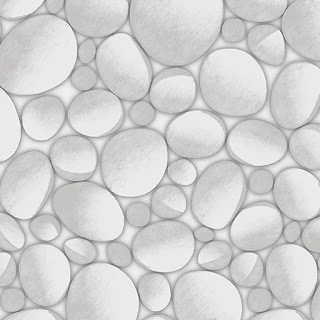 Don't you just want to touch them?! Click here to see the entire Bali Desert Sunset collection. Congratulations to these lucky winners! You'll be receiving a bundle of holiday fabrics. 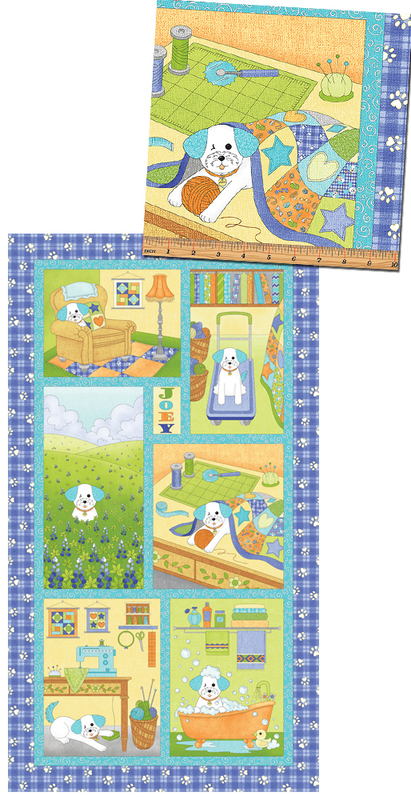 You've fallen in love with Joey's story and the Joey the Shop Dog fabric collection. Who wouldn't? The next question is, what will you do with it? Here's a look at Joey's section of our Quilt Market booth. 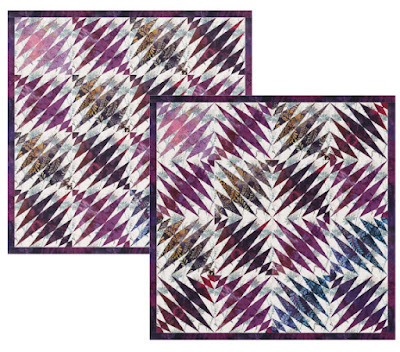 You can see how versatile the panel is--on the right, it's used in a panel quilt (find the free pattern for a second panel quilt in this post!). The fussy cut blocks are also used for pillows on the futon. Sew cute! 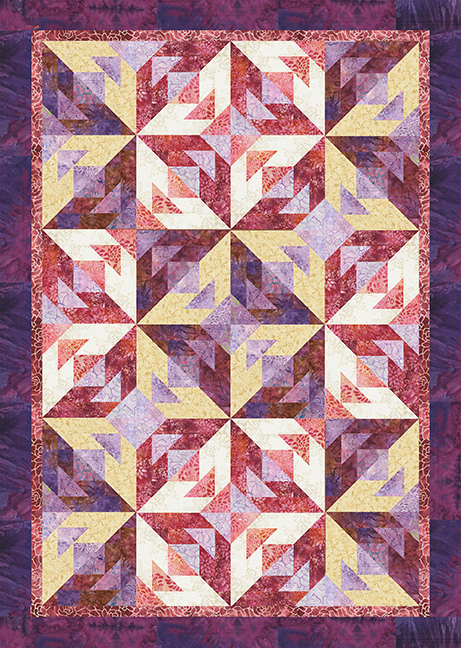 Click here to download the pdf for this free quilt pattern. 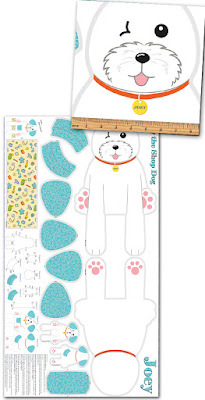 This pup-themed line is perfect for pet projects as well. Whether you're looking for small quilt ideas for your own dog or to donated to a shelter, you'll find some simple ideas below. 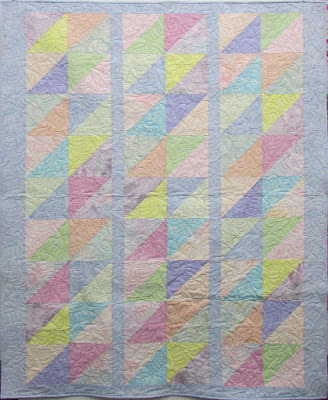 Click here to download a pdf of simple kennel quilt patterns. 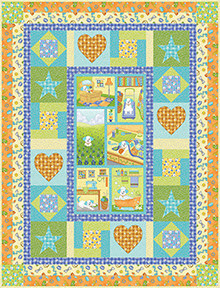 Coming soon...Rose Ann has created a cloth book out of the blocks in the panel. 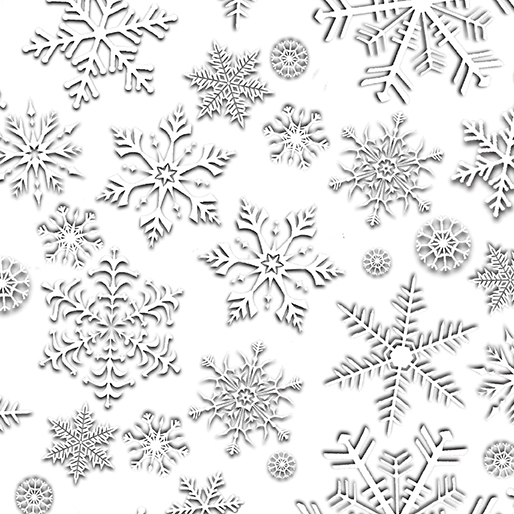 Keep an eye on her website to find out how to get this pattern in early 2017. 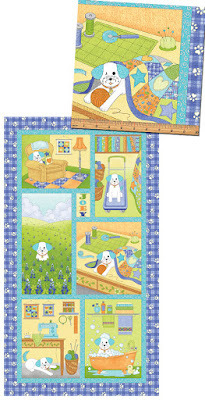 Click here to see the entire Joey the Shop Dog fabric collection. Click here to learn more about Joey. 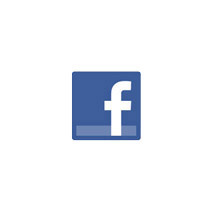 Click here to visit Joey's Facebook page. Click here to visit Rose Ann's shop webpage. 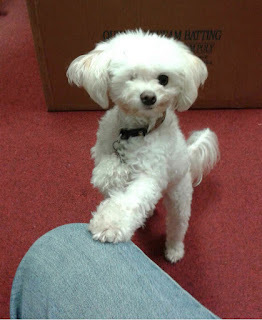 In our last post, we shared the story of Joey the Shop Dog. 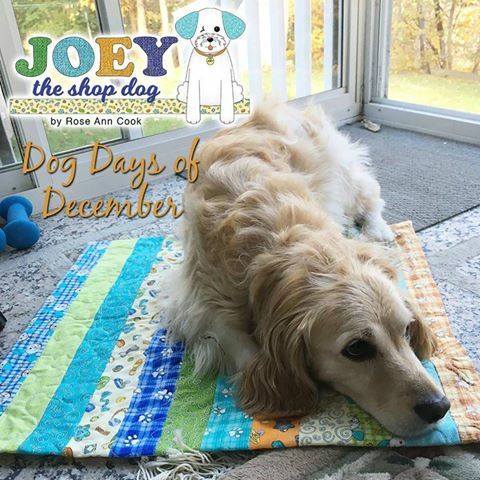 Today we're sharing the story of Joey's fabric collection, also named Joey the Shop Dog. 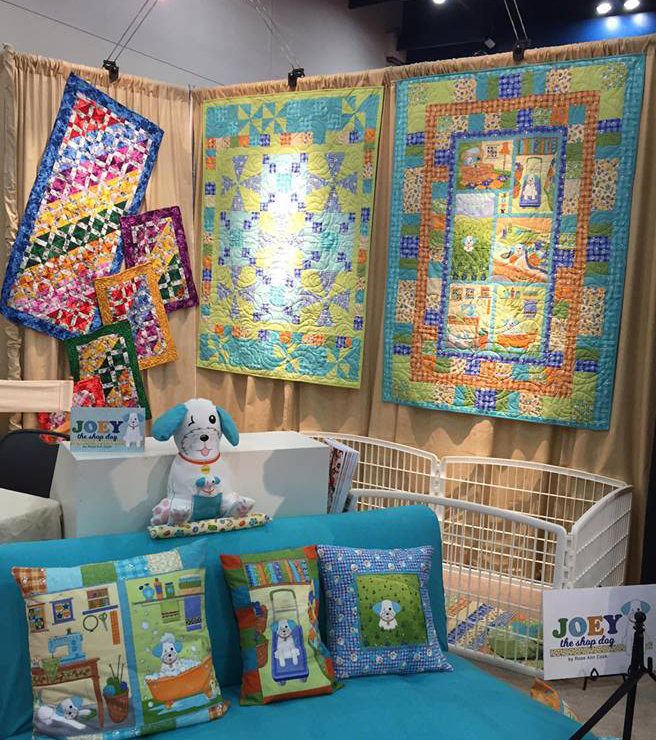 As Joey grew in popularity at Rose Ann's store, the idea for a fabric line grew. My staff has been pestering me about doing a fabric collection. I always felt that Joey was such a perfect subject to have a fabric line around. Not only is he popular in our little world, but everyone who sees him from out of town thinks that he’s such a cute little dog. How did the fabric line come to be? I chose photos for inspiration, and many of the blocks in the panel (see below) are based on those photos. For example, Joey on the shopping cart. When we’re moving boxes in the shop, he’ll jump on and we’ll give him a little ride. The collection includes a second panel to make a stuffed Joey, which was a fun surprise for Rose Ann. This collection does more than just make quilters happy, however. It supports shelter animals as well, with 10% of sales for Joey’s fabrics being donated to The Petfinder Foundation! Rose Ann's reaction to this charitable news? When Benartex suggested that the line could have a charitable tie-in, I almost flipped. It was more than I could ever have dreamed of, that they’d be so invested in this that they’d contribute money to a non-kill shelter. Not only do we get to share Joey with other quilters, we also get to help out other animals. 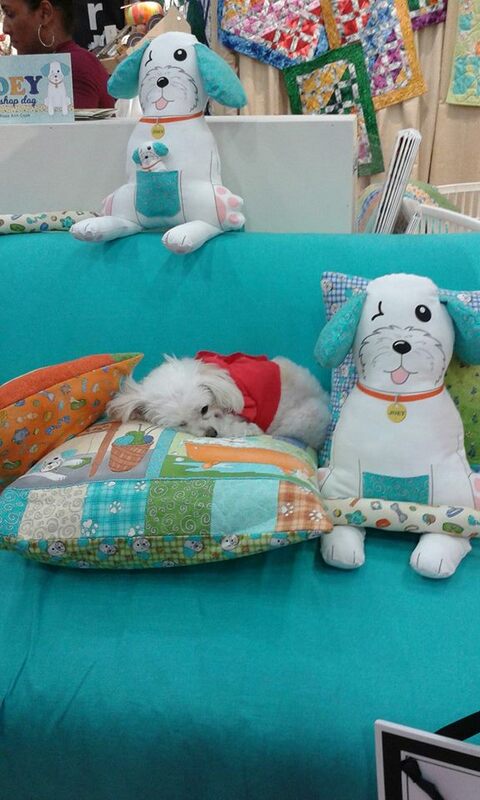 Joey even came to Quilt Market--here he is snuggled up with the Joey section of the booth! Back in October during the Piece for Shelter Pets Blog Hop, we gave you a quick introduction to our new favorite pet, Joey the Shop Dog. 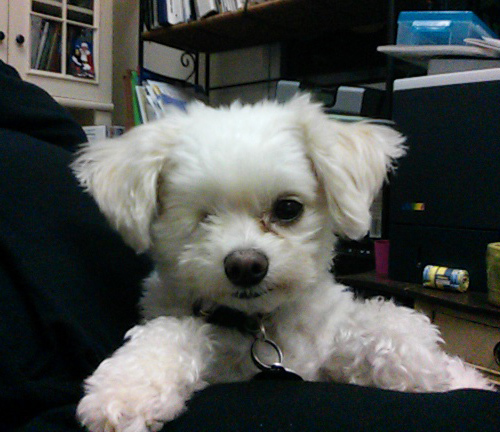 As a newborn puppy, Joey was abandoned. 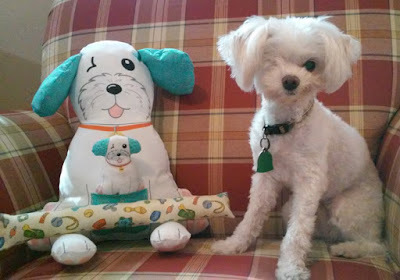 When he was brought to the local SPCA, he immediately underwent surgery to remove a damaged eye, and remained very sick. Enter quilt shop owner Rose Ann Cook, who along with her husband, has a soft spot for dogs with health issues. 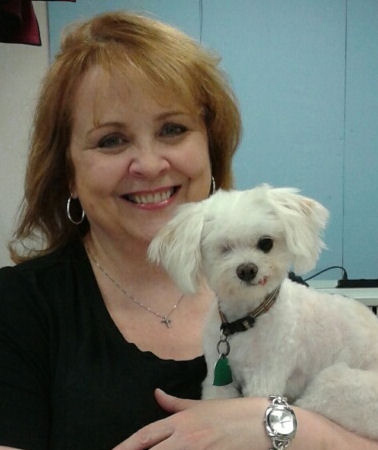 "When I met Joey, we already had three dogs, and that's usually as many as we have at one time," Rose Ann says. "I surprised my husband by bringing him home. 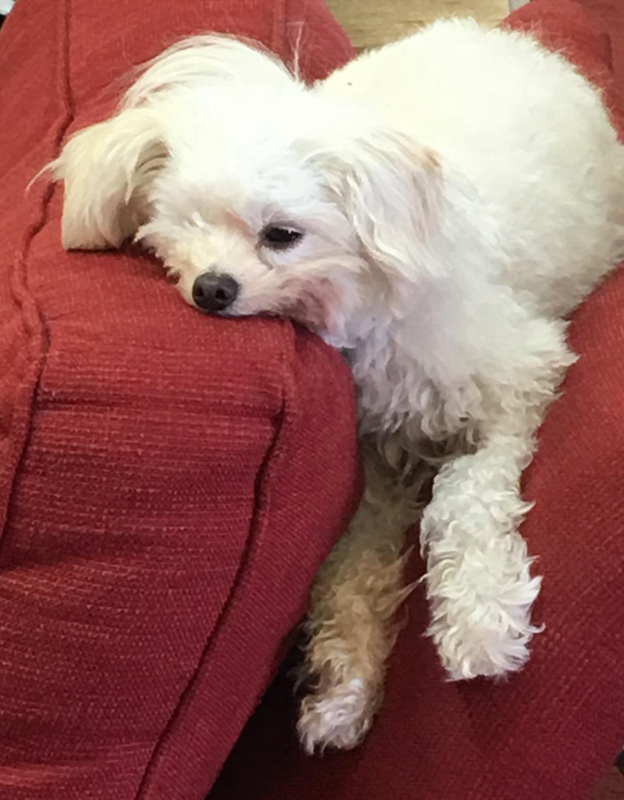 I knew this dog wouldn't make it if we didn't take it home." If you've seen our Joey the Shop Dog collection, you know this story has a happy ending! 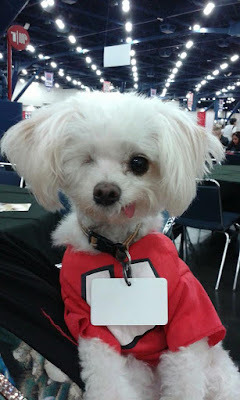 Joey was adopted by Rose Ann Cook and her husband almost six years ago. 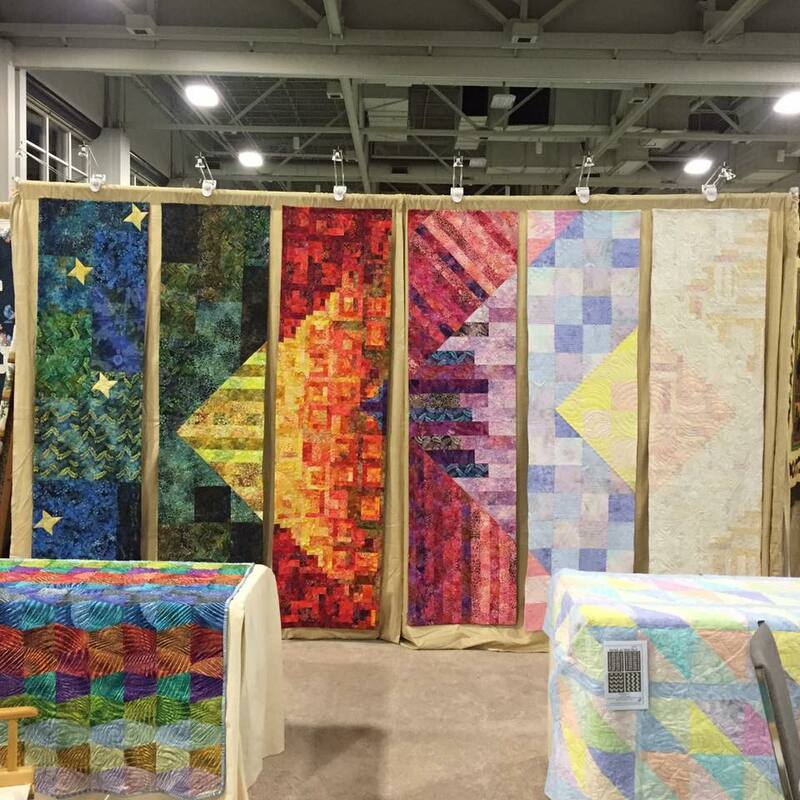 He’s made his home both with the Cooks and in Rose Ann’s quilt shop, the Quilter's Emporium in Stafford, Texas. 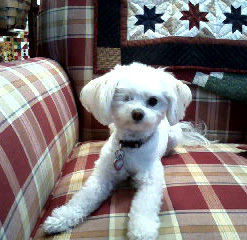 Why did Joey catch your eye? 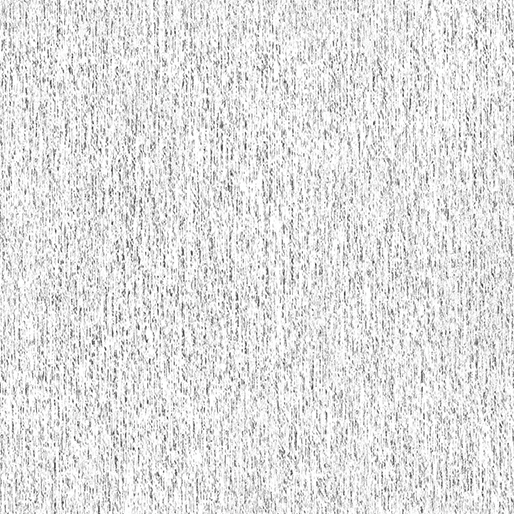 What I can say? We look for dogs that have serious issues. That doesn’t mean that they can’t be loving, wonderful pets. As a matter of fact, I think they become the most grateful pets. We have no children—this is our calling to take care of dogs that otherwise would be put down. How did Joey start coming to the quilt shop? I go to the shop every day, and I felt I needed to take him along to look after him. Every single female customer who walked through the door is a mother at heart, and they all fell in love. 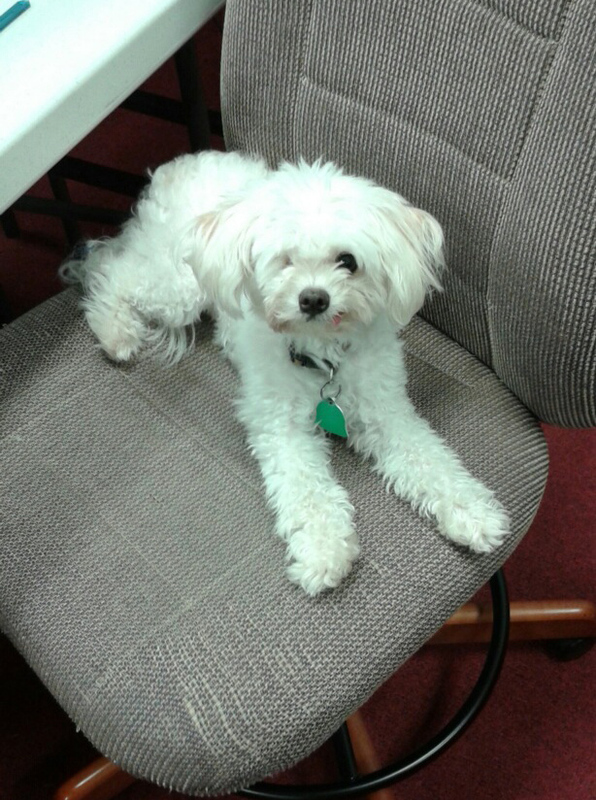 He’s a little fixture around the shop. Joey actually has a fan club. Some customers only come in on Joey days. How has Joey’s fame spread? He tells me what to write for an article in each of our newsletters. If there isn’t something from Joey in the newsletter, we actually get phone calls checking on him. He recently came in 6th place in the SPCA calendar contest, so he’ll be featured in the 2017 calendar as well. He also has his own Facebook page! How else has Joey helped the cause of strays? If someone local finds a stray, they’ll send me a pic, and Joey will write up a story about the stray—have been able to find homes for about 2 dozen dogs. Joey does so much good. 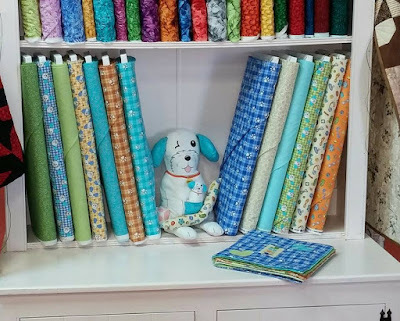 We'll be sharing up close and personal looks at the fabrics in Joey's collection, as well as some fun projects made with the fabrics later this week!